vampire bella. . Wallpaper and background images in the Breaking Dawn The Movie club tagged: bella swan on set part 1 breaking dawn photoshoot kristen stewart. 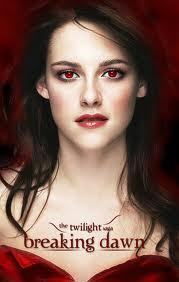 This Breaking Dawn The Movie fan art contains portrait, headshot, closeup, attractiveness, appeal, and hotness. I like the pic. But bella isnt supposed blush. But it the best one I seen so far.